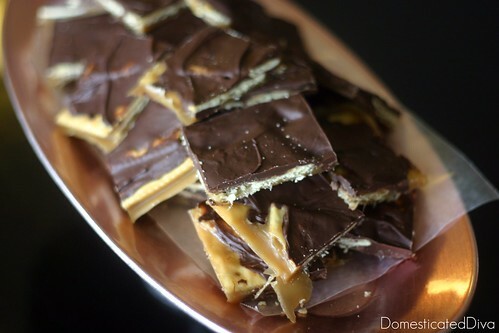 Who would have thought that saltines, caramel and chocolate go together and create bliss?! Not me! I am sure there is someone or 500 two that knew that the salty crackers goes fantastically (apparently fantastically is a word since spell check didn’t underline it in red) with the sweet chocolate and caramel. If you are like me and have never tried or even thought about this combo then you are in luck, because this recipe is one of my favorites. There is nothing more appealing to me (in terms of food) than a recipe that is cheap and easy to make. Line a 15x10 jelly-roll pan with lightly greased aluminum foil. 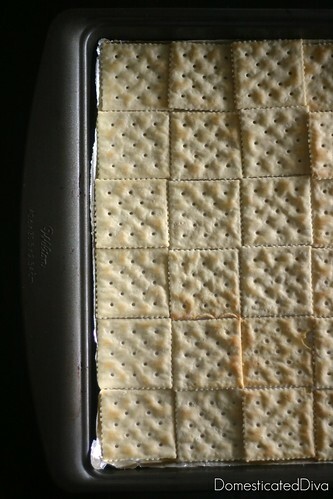 Arrange the crackers in one layer, making sure to cover the whole pan. Set aside. Combine brown sugar, butter and corn syrup in a saucepan over medium heat. Boil for 4 minutes, stirring constantly. Pour hot mixture evenly over crackers. Bake at 375 degrees for about 5 minutes. Remove from the oven; immediately sprinkle with chocolate chips. Return to oven for about one minute, until chips melt. 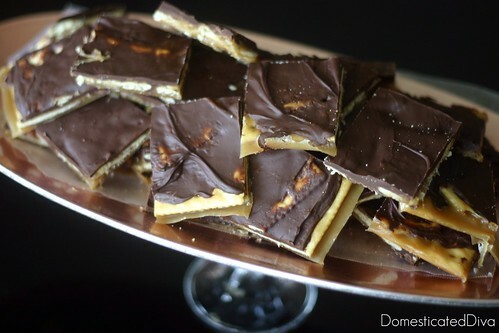 Remove from oven; spread chocolate chips over the crackers with a spatula until smooth. Place pan into the refrigerator to cool. When set, break into serving-size pieces.